May is finally upon us which can only mean one thing - Cinco de Mayo! It may not be New Year's Eve or St. Patrick's Day, but it's that much better because chances are you'll get much better weather. New York City is one of the top destinations in the country for all things Cinco de Mayo related. 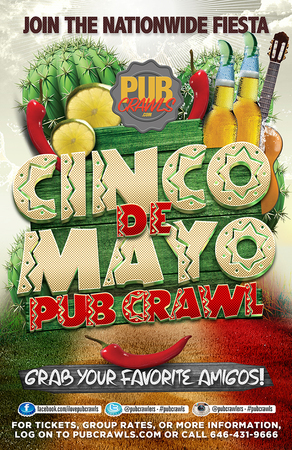 We're prepared to put together yet another colossal event in the Big Apple - the official Cinco de Mayo Pub Crawl! Be prepared to enjoy some of the most classic Mexican drinks such as Margarita's, Tequila Shots, Sangrias, and Goiabardente's. Meet new friends at some of the top bars that the East Village has to offer and take comfort in knowing that we have put together the ultimate bar hopping package for this year's Cinco de Mayo festivities.